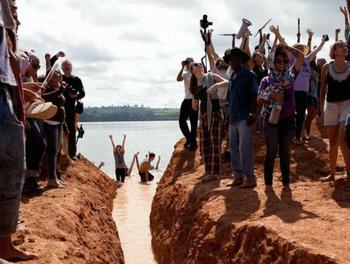 Indigenous peoples, farmers, fisherfolk, activists and local residents marched onto a temporary earthen dam recently built to block the flow of the Xingu River. With pick axes and shovels they opened a channel in the earthen dam to restore the river’s natural flow. They aim to send a message to the world before 134 world leaders gather in Rio June 20 to 22 to make commitments to ensure development that protects the planet for future generations while serving the needs of today’s nearly seven billion people. A delegation of international observers and human rights advocates, including Brazilian actor Sergio Marone of the Drop of Water Movement, came to witness and raise awareness of the protest. 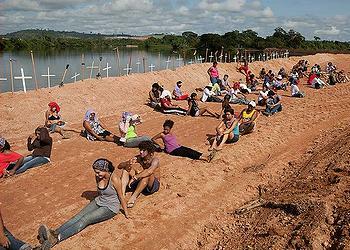 Demonstrators erected 200 crosses on the banks of the Xingu to honor the lives of those lost defending the Amazon. They planted 500 native acai trees to stabilize the riverbank that has been destroyed by the initial construction of the Belo Monte Dam. Also Friday morning, hundreds of Altamira residents marched to the headquarters of dam-building consortium Norte Energia, NESA. The actions are part of Xingu+23, a multi-day series of festivities, debates and actions to mark 23 years since the residents of the Xingu first defeated the original Belo Monte Dam proposal. Residents have been gathering in the community of Santo Antonio, a hamlet displaced by the consortium’s base of operations and in Altamira, a boomtown of 130,000 affected by the dam, which if completed would be the world’s third-largest hydroelectric project. The Belo Monte Dam is one of about 70 large dams planned for the Amazon Basin. In Rio, Brazilian government officials are highlighting Brazil’s use of hydropower as a clean, sustainable source of electricity. Last year, Brazil generated 44 percent of its electricity using sources such as hydropower, wind, ethanol and biomass in its energy matrix, while the world average is 13.3 percent. 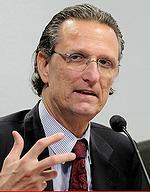 “The share of hydroelectricity is one of the highlights of the Brazilian energy matrix,” attendees heard from Mauricio Tolmasquim, president of the Empresa de Pesquisa Energetica, the public agency responsible for research that supports energy sector planning. The Belo Monte dam would divert 80 percent of the Xingu River’s flow through artificial canals, flooding over 600 square kilometers (232 square miles) of rainforest while drying out a 100-kilometer (60-mile) stretch of the river known as the Big Bend, which is home to hundreds of indigenous and riverine families. Protesters say that although it has been “sold to the public as clean energy,” the Belo Monte dam would generate an enormous amount of methane, a greenhouse gas many times more potent than the most abundant greenhouse gas carbon dioxide. The initial filling of a reservoir floods the existing forest, leading to the death and decomposition of the carbon-rich plants and trees. The rotting organic matter releases large amounts of carbon dioxide into the atmosphere. The decaying plant matter then settles to the bottom of the reservoir, and its decomposition releases dissolved methane.